Anita Jo Intenzo-Haunted Author: CAN OBJECTS BE HAUNTED? As I mentioned in my last blog about hoarding and haunting a collector can unwitting bring an object home from an antique store, flea market or a garage sale and somehow a spirit could be attached to it. Or you may have been given a handed down family heirloom from your great aunt and suddenly weird things are happening in your house. Is this a manifestation of ghostly activity or just someone’s over active imagination? One of the stock and trades of TV shows like Haunted Collector are dealing with this very subject each week as the team tries to solve the mystery for different individuals who are experiencing “haunting” due to some object that is causing the paranormal activity. If they are successful in identifying the object causing the haunting, the star of the show, John Zaffis, then asks the homeowner if they would like him to take the object away, which they usually do, and later shows him adding this item to his vast collection in his “Haunted Museum” in Connecticut. He “grounds” the object with salt and places it under a glass dome. This is supposed to keep the spirit at bay. I wonder though, if he has that many haunted objects in one place you would think his museum would be the most haunted place in America? Remember what happened in the first Ghostbusters movie when they collected a huge amount of “spirits” and contained them in a special chamber? The power got turned off and the pressure of the energy of these ghosts busted through with thousands of them raining down havoc on the city of New York. I’m glad I don’t live in Connecticut! There can be hundreds of objects with their ghostly stories we can discuss that could possibly have spirits attached to them. For brevity sake, let’s talk about some of the more popular objects that seem to attract spirits more than others. My literary agent Laurie Hawkins was cautious about taking me on as a client at the beginning. Her apprehension wasn't about my abilities as a writer and she was confident that I had a unique and terrifying story that would make a great book. She was worried about the paranormal aspects and her fears were well founded. She had experienced ghostly activity before in her own life mainly dealing with an old mirror a friend gave to her. No sooner did she hang it in her home then she was visited by the spirit of a little girl and other ghostly phenomena started to occur: strange faces seemed to be reflected in the mirror, objects were moving in her home and disappearing that finally my agent couldn't stand it and wrapped the mirror up and stuck it in her attic. She would like to get rid of it but is feels personally responsible if she gave it to someone else that they could then be haunted. What makes a mirror haunted? For centuries people have been cautious with mirror in their various cultures. I remember my mom telling me in some of the older Italian Catholic traditions, that when a person died, you covered over the mirrors in your home for a period of time. Is it the idea that it reflects or represents a different dimension that a person’s soul could enter? How about the superstition that if you broke a mirror you had seven years bad luck? Are you tempting evil or misfortune by doing this? Pandora’s Box- The Greeks had their myth of a beautiful alluring box that came with the gods warning not to open it-but because we humans are by nature curious, of course someone opens it and releases terrible misfortune, pain and evil in the world. Today we still use the term to describe something that should be left unopened or disturbed or suffer terrible consequences. There is something very old in the human conscience about containing and being in control of something in a small boxed-in area. If someone thinks they've contained a spirit or demon in a box- can it store up energy that can have horrible consequences if opened and released? 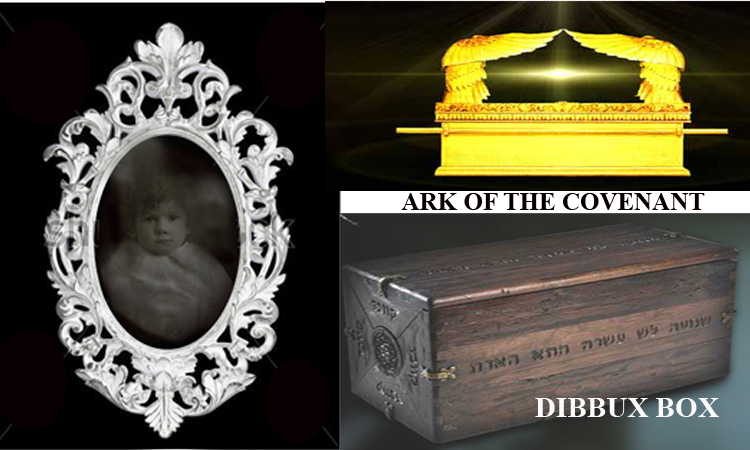 The Ark of the Covenant-This is one of the supreme religious objects both revered and feared. This golden box with its winged guardians on top and is literary the home of the Ten Commandants. If opened can supposedly unleash the power of God and any army that holds this relic in their possession would be invincible. No wonder Hitler had his Nazi Army scourer the earth for this and many other religious artifacts during World War II. This is not something Hollywood dreamed up as this has become a known fact. Dibbux Box- The dybbuk box or dibbuk box is a wine cabinet which is said to be haunted by a dybbuk. In Jewish folklore, a dybbuk or “dislocated spirit” is a restless, usually malicious, spirit believed to be able to haunt and even possess the living. Have you heard the story based on this box? It’s the true account of a series of eerie events that unfold when a wine cabinet sells at an estate sale in Oregon. It is soon sold and resold on eBay, and each new owner becomes desperate to get rid of the box along with the health problems, accidents, or death they claim came with it. In the book by the same title, the main character places a bid on eBay and soon finds himself the proud owner of the Dibbuk Box. But as he carefully investigates and records everything he can about this unusual item said to be possessed by a Jewish spirit, he discovers a dark story that comes to light that began at the time of the Holocaust and seems to have come full circle. Weapons: Guns, Knives, Swords, Daggers, Axes, from all world cultures. This includes a wide range of any type of item that was used for personal defense, killing or murdering someone throughout all world cultures. Military weapons come to mind first along with parts of uniforms including, buttons, hats, buckles, shoes, satchels and combat medals that were personally associated by the soldier. Because of their unique properties (mostly metallic) and used for mainly for destructive purposes imagine the potential violent energy stored on these pieces! Are the weapons cursed by the evil their owners did as they dealt a death blow to their victims? In one episode of the Haunted Collector, John Zaffis removed a piece of a civil war officer’s uniform to his museum when it was research revealed that this man had met with a horrific death in battle and his spirit was haunting the owners of the 1800’s house. Only after acknowledging this forgotten historical incident and giving this person recognition for his brave military service was this spirit laid to rest. 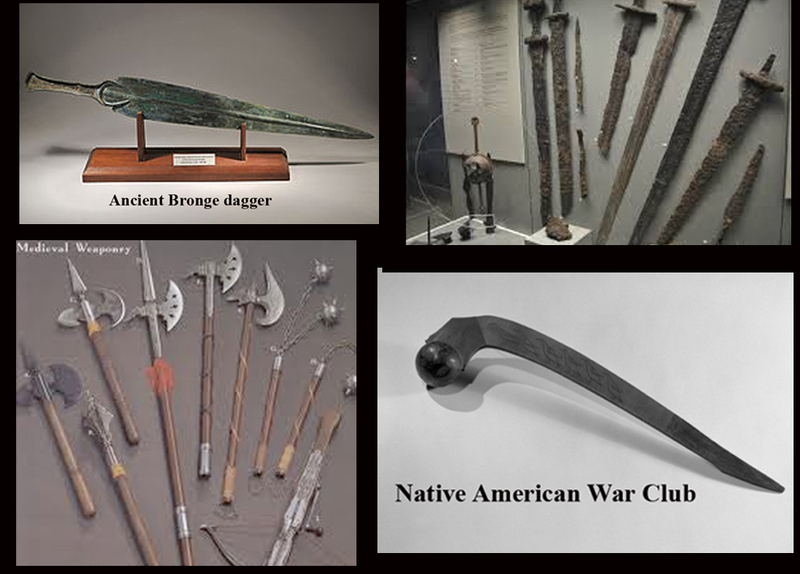 Seeing ancient weapons at our local art museum I realized looking at the swords, battle-axes, spears and daggers that they were used to cut, thrust into, slash, dismember, impale and even disembowel another person. It can give you the chills thinking, these weapons have taken someone's life. They have blood on them. Perhaps these things didn't kill just one person. They killed lots of people. Does that make the sword or ax evil? Or present a vehicle which spirits are attracted to and can find a home? The Winchester Mystery House is a well-known mansion in Northern California. It once was the personal residence of Sarah Winchester, the widow of gun magnate William Wirt Winchester, who invented the Winchester Repeating Rifle. Although this is disputed, popular belief holds that a Boston medium told Sarah Winchester that she had to leave her home in New Haven and travel west, where she must "build a home for you and for the spirits (mostly Native Americans) who have fallen from this terrible weapon, too. You must never stop building the house. If you continue building, you will live forever. But if you stop, then you will die." It was continuously under construction for 36 years and is reported to be haunted. Interestingly, the mansion had only two mirrors in the whole place. This is because Sarah believed that ghosts were afraid of their own reflection. Under Winchester's day-to-day guidance, its "from-the-ground-up" construction proceeded around the clock, without interruption, from 1886 until her death on September 5, 1922, at which time work immediately ceased. It now serves as a tourist attraction. A word of caution to anyone the next time you are at an antique shop, flea market or garage sale and find you are attracted to and have to have that cool sword or blanket chest or even that carved mirror at such a reasonable price think about the purchase cautiously. It may be that although you got a “steal” you may have to “steal yourself” against supernatural forces that came along for the ride and in turn you may be getting more than you bargained for! Next week I will talk about one of my favorite subjects, Dolls, and what makes them one of the most feared of Haunted Objects. Great post! I'll have to check out the older ones too. This makes me think of two things. 1. Sarah Estep (passed on EVP researcher) got communication from spirit instructing her to use a small mirror next to her recording devices to aid in the communication. This prompted me to use a larger and older mirror in my recording space for a while, though I don't believe it was much help. 2. The haunted collector's museum is very similar to Lorraine Warren's museum that has had so much attention placed on it again because of the new moving The Conjuring. Thank you so much for your comments. I just checked out your awesome website and I am so glad you like my post and hope you will read my other blogs and see my Book Teaser we produced last summer. You have listed some great resource materials on your site and your group MOSS sounds like you guys are doing some interesting research. Yes, mirrors are really intriguing to work with but the results can vary as they reflect so much in a room that interpretation can be inaccurate. I like the idea of an EVP meter near one though to record anomalies. I just started my blog last month and have had almost 500 page views, which is most gratifying for all the time I've put in for my posts. I base much of my subjects on what is a combination of recent research/history(Lorraine Warren's Museum would rival anyone's since she has been at this so long) and my own personal experiences with the paranormal which started in 2009. My debut book, Estate of Horror, is under consideration with several publishers and my agent has been a great supporter of me and my story. On another note: My son saw the Conjuring last week and thought it OK on the scary meter- but it takes a lot for him to be scared- as he talks to ghosts! (He gets a blog dedicated to this in the future) I wish you the best of luck in your investigations and please keep in touch. Thanks again, Anita.